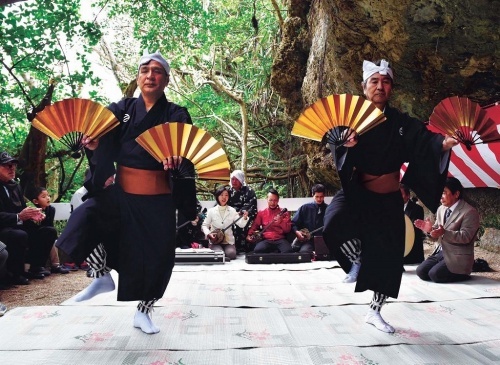 On February 8, the date of the Lunar New Year, the first prayer of the year, “Hachi ugan”, was offered at a hallowed ground, “Shirumichu”, in Katsuren Higa in Uruma City. It is said that an ancestral god of Ryukyu, Amamichu, and Shirumichu are enshrined in a cave on a hill in the area. Residents played sanshin and taiko, and performed dances as they prayed for a state of perfect health and a prosperous year. At Shirumichu, a stalactite enshrined in a cave is a sacred stone believed to have provided the treasure of a child. For the beginning of the year, Noro (shaman) of a community prayed with offerings of rice and sweets. Many residents who visited Shirumichu prayed for the prosperity of the community.